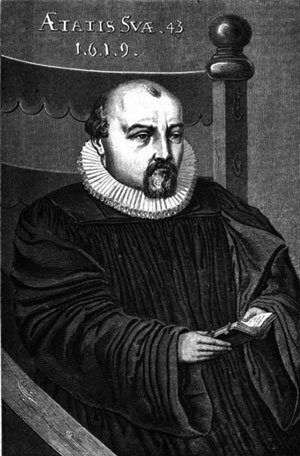 Jean Salomon de Caus (1576–1626) was a French Huguenot engineer and scientist, who spent his life moving across Europe. He worked as a hydraulic engineer and architect under Louis XIII from 1623 till his death in Paris in 1626. de Caus also was in service of the Prince of Wales and designed gardens in England, that of Somerset House among them; he also designed the Hortus Palatinus, or Garden of the Palatinate, in Heidelberg, Germany (from 1614 till 1620 he was engineer to the Elector Palatine, Frederick, at Heidelberg). In 1615, in Frankfurt de Caus published the book Les Raisons des Forces Mouvantes avec diverses machines tant utiles que plaisantes (The reasons for moving forces with various machines as useful as pleasant). 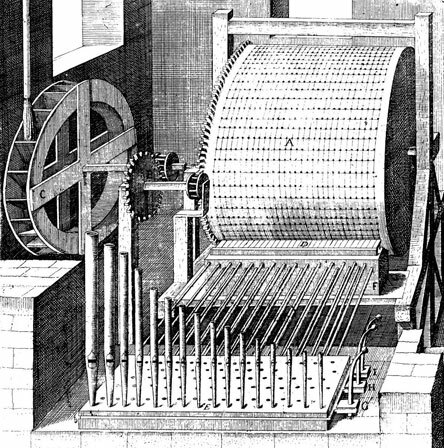 It was an engineering treatise, which incorporated mechanical fountains, musical instruments and other automata. His interest in these mechanical devices may have been influenced by the recovery of ancient texts by Heron of Alexandria around this time. 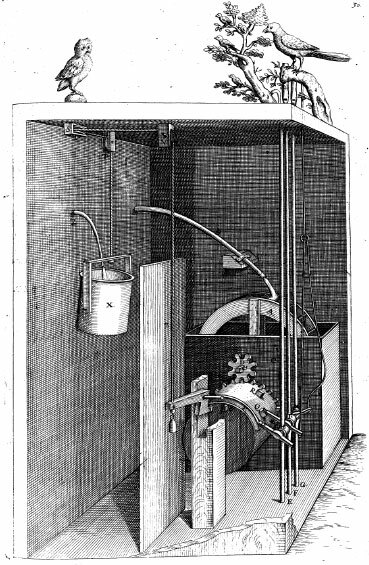 In his book de Caus described an organ (see the upper image) in which a pegged cylinder, turned by a water wheel, activated levers which triggered bellows to force air through pipes. A notable piece of work of de Caus was an automaton that had singing birds (see the picture below), directly influenced of a design by Heron. The birds flutter and chirp while an owl turns slowly toward them. When the intimidating owl faces the birds, they fall silent, but as he turns away, they resume their ruckus. 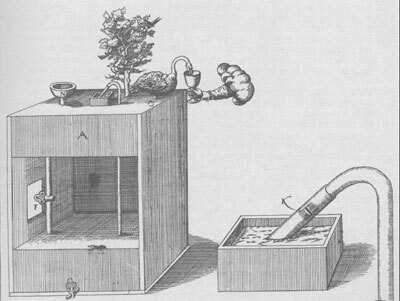 A water-driven singing bird automaton, designed by de Caus. Another automaton of de Caus, a water-driven swan. De Caus's treatise also contains meticulous accounts of the mechanisms of hydraulic grottoes (a small caves or caverns). In one (see the image below), Galatea rides astride a big seashell drawn by two dolphins. Behind her, Cyclops has put his club aside to play on a flageolet, while sheep gambol about. The mechanism is made entirely of wood, driven by two waterwheels, that are put in motion by jets of water from two pipes that emerge from a common reservoir. The pipes have valves that open and close alternately by means of a system of counterpoises, so that the wheelwork turns one way and then the other as Galatea and her dolphins move back and forth across the scene. A third waterwheel, through a train of gear-wheels, drives a pinned barrel that is in turn connected with the keys of the flageolet. 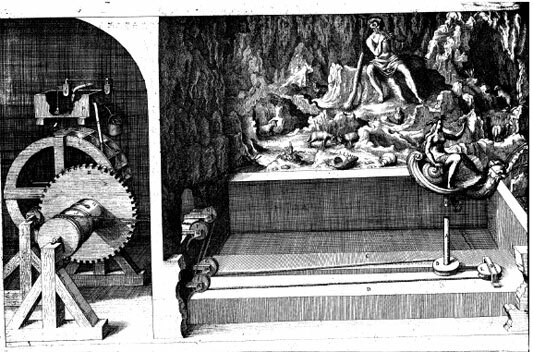 Another automaton of de Caus, a hydraulic grotto. Who was Salomon de Caus? Jean Salomon de Caus was born in 1576 in Dieppe, Normandy, into a Protestant family. The whole family moved to England, where Salomon obtained his education. From 1595 till 1598 de Caus visited Italy, where he observed the garden of Bernardo Buontalenti in Pratolino in Florence with the mechanical arts and the Villa d'Este at Tivoli, near Rome. Inspired by Pratolino he designed several gardens and related structures fountains, grottos and machinery. From 1598 till 1610 de Caus was an engineer (from 1605 a chief engineer) at the court of the Austrian Archduke Albert VII of Habsburg, governor of the Netherlands, and his wife Isabella in Brussels. In 1610 de Caus returned to England to serve at the court of King Charles I and of Henry, Prince of Wales, whom he taught at drawing. Together with the architect Constantino de' Servi he built water features and a picture gallery in Richmond Palace. De Caus built also gardens in Greenwich Park, Wilton House near Salisbury in Wiltshire, Hatfield House in Salisbury and Somerset House (London), as well as some work in Richmond park, Gorhamburry, Camden House in Kensington. From 1613 till 1620 de Caus was the architect and engineer of Elector Friedrich V in Heidelberg. De Caus was the architect of the part built under Frederick V at the Castle of Heidelberg. He was also the architect of Elisabethentors and the designer of Hortus Palatinus. In 1620 de Caus left for France, to Rouen, then to Paris, where he got the position "Engineer et architecte du Roy" (Louis XIII) and was among others responsible for the sanitation and fountains. Salomon's brother, Isaac de Caus, also an engineer and landscape architect, is the creator of the Hortus Penbrochianus (Wilton House) in 1615. On 16th April 1606, Salomon de Caus married to Esther Picart. On 24th February 1607, was born his son Guillaume. Salomon de Caus died on 28 February, 1626, in Paris.